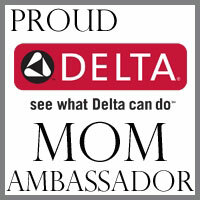 Disclosure: This blog post is part of a paid SocialMoms and Buddy Fruits blogging program. The opinions and ideas expressed here are my own. It's a sad situation, but unfortunately, obesity is running rampant in our society today. Part of the problem, in my opinion, stems from the fact that families are busier now than ever before. Both mom and dad are holding down one or more jobs and the kiddos are in every extracurricular activity from music to sports. With all of this hustle and bustle, finding a time to prepare quality meals and snacks is challenging. Most of the time, it's just more convenient to grab a sack of fast food and be on our way. Thankfully, Buddy Fruits has come to the rescue! Now, it couldn't be easier to have a healthy, delicious fruit snack on the run. Keep reading to learn more about this amazing dietary staple and how you could enter to win the family vacation of a lifetime! Enter to win 1 of 2 family trips to Paris from Buddy Fruits. Buddy Fruits is an innovative product designed to deliver healthy food on the go. Unlike sugar-laden juice drinks or even 100% fruit juice, which contains no tummy-filling fiber, yet plenty of calories and sugar, Buddy Fruits serves up 100% FRUIT! They have a wide variety of pouch products, which are perfect for tossing in your purse, backpack or lunch kit. Now, there's no excuse to visit a drive-thru again to satisfy those hunger pangs. With Buddy Fruits, you can enjoy delicious fruit in a hurry. Buddy Fruits uses only the flesh of the fruit from trusted farmers around the world. Their products are all natural and never contains preservatives, colorings, genetic modifications, artificial flavorings, water or corn syrup. They're also dairy and gluten free for even the most sensitive tummies. If that information doesn't make you smile, I'm sure this will: How about a chance to win a trip for 4 to Paris? 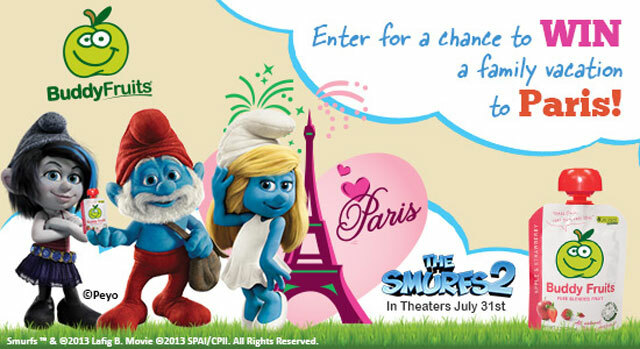 Two lucky families will be chosen to win in the Buddy Fruits Smurfs 2 Sweepstakes! Make sure to enter weekly for not only the trips but other Smurftastic prizes as well. While you're there, stop by the downloads section of the site too for some super fun coloring pages and Smurferrific wall paper too. This summer, make sure to have plenty of healthy Buddy Fruits snacks on hand for convenient, delicious nutrition to take you right into the new school year!